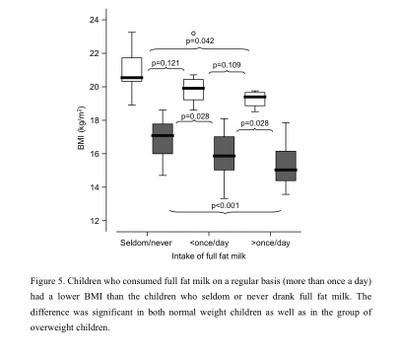 Did this study attempt to determine whether the correlation between milk intakes produced the difference in BMI or if it was the result of pre-existing differences in BMI? This is significant. Correlation does NOT imply causation. Parents of overweight children might feed them the low fat milk because they have been told it will prevent further weight gain. The studies linking diet soda with overweight are flawed for this very reason. People without weight problems rarely drink diet soda so the correlation of diet soda intake with overweight is the result of the overweight, not the cause. Absolutely. I drink cream, the heavy people at work eat Weight Watchers low fat yogurt. Causality, who knows? Interestingly enough, the same trend was observed in the group of normal weight kids and in heavier ones. And if you take a look at the BMI readings of the gourps, it seems that the "heavy kids" were not that heavy in Sweden, either. Also, this is a second report on the same study group. First one was published on 4y olds and this one after four more years. In the thesis they also told that food choises did not vary much between the 4 and 8 year mark; i.e. dietary habits were set early. Interestingly enough, the author tell also that lipids were compared with the Finnish STRIP kids (low fat, low SAFA, high-fiber; i.e. very comm-il-faut iontervention) and that the Swedish ones tended to have lower cholesterol values than their Finnish age mates... Maybe it is not to be wondered why the Finnish study has failed to report any beneficial effect of the intervention in 20 years?